The Ibis Ambassador group opened in Seomyeon, Busan! 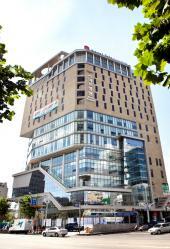 Ibis Ambassador Busan City Center is perfectly located at the intersection in front of Bujeong station in Seomyeon, so-called ‘Myeongdong in Busan’. The hotel is also suitable for business travelers as the hotel is in the business district of CBD. Ibis Ambassador group, famous hotel group as the European style business hotel opened the fourth branch in Busan following Gangnam, Myeongdong and Suwon branch. The building has 4 basement floors and 17 floors above ground. There are commercial facilities in 1 and 2F, 3-9F is a hospital and the hotel occupies 10-17F. There is an information desk of the hotel in 1F, and the front desk is in 17F. As the hotel facilities, there is a conference room capable of 20-80 people, banquet room and restaurant ‘Taste’ which offers health-conscious food. There is also a business center where business travelers can use. Front desk is open 24h, efficient service and beautiful view from higher than 10F awaits you. The hotel is surrounded by Lotte Department Store, Duty Free Store and aesthetic medical district, and it is also convenient to access major tourist sites.